Well, that's it, everybody. My Jane event is over for another year. Thank you all so much for stopping by. I kinda love you guys. Really. I love how enthusiastic all of you are, whether you're old-hat at this Janeite stuff, or completely new to the game. I love you you throw yourselves into the discussions, both having fun with them and being really well-spoken and passionate. You all bring such interesting perspectives and new ideas to the table, and you guys listen to each other, respond to each other, and just generally show what a freaking amazing community Janeites make. Big thanks, too, to all of the amazing authors and guest posters who participated in this year's AIA. You guys help make this the cool, full, fabulous event that it is, and I couldn't do it without you. So THANK YOU. Below is a survey, which if you're inclined to fill out, would be helpful and awesome. It's brief, it's completely anonymous, and it's about your overall experience and suggestions. Thank you all, and until next year: keep reading Jane! I appreciate the opportunity to share my thoughts on your event, Misty. It was a perfect wrap-up to my summer, thanks! I feel so much better versed in Mansfield Park in particular and Austen in general after spending time with the bloggers, authors and other visitors. Misty, you know your business. 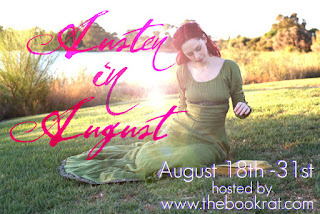 = ) "Austen in August" was such a fun online experience. Thanks for running the event Misty. Not only did it prompt me to reread Mansfield Park,which I'd been meaning to do for ages, but I got a lot out of seeing what other people thought of it.